Nora Boedecker has had recurring nightmares about being onstage without knowing her lines since a young age, so improv is basically a dream come true. 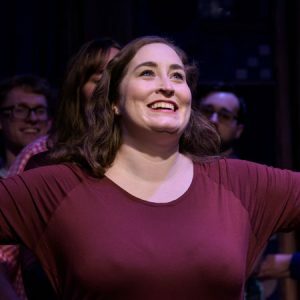 In spite of self-identifying as a theater nerd in her youth, it took Nora until 2016 to try improv because the prospect of being onstage without a script was terrifying. Turns out she’s kind of a fan. She completed the WIT curriculum and performs locally with the indie team The Basement Gang. When not doing improv, Nora is most likely to be found with her dog, Miss Cleo, or out somewhere telling people how much she misses her dog. She works as a graphic designer in the corporate research world, which is fine. But honestly, it’s just to keep Miss Cleo stocked up on dog food and Star Wars toys.